With gold so hot right now, there are lots of gold-buying options to choose from. You could trade futures contracts. You could buy gold-mining stocks. You could buy a proxy for gold in the form of a gold ETF. There are even gold mutual funds. But almost any expert will tell you the same thing: if you want exposure to gold, nothing is better than holding the physical metal including gold coins. Even still, there are options: You can buy bars, rounds, or coins. And even once you settle on one of them, choices still abound! This article will focus on gold coins. Coins are different from rounds in that coins are issued by governmental authorities – rounds are issued by private mints. Libertarian sentiments aside, government coins are generally more widely accepted – not everyone is a libertarian, after all. Thus, this added liquidity generally makes these coins more preferable to rounds. Whether you are looking to invest, hedge inflation or acquire survival-based precious metals, now may be the perfect time to pick up some of the world’s most revered gold bullion struck into coins. With greater resale potential than bars or rounds, a value that will only accrue more worth over time and a hypnotizing beauty, the following 10 are our winning choices. A perfect amalgam of the American spirit, the American Eagle is instantly recognizable worldwide. With Liberty striding on one side and bald eagles nesting on the other, the 1-ounce coin boasts only metals drawn from U.S. mines. At 91.67% fineness, its 22k alloy contains 3% silver and 5.33% copper for durability, with the U.S. Mint’s guarantee of content and purity. From 1986 to 1991, Roman numerals dated the coins. In 1992, the Mint adopted Arabic numerals. The American Eagle 1-ounce gold coin, issued in limited numbers each year, offers investors two choices: proofs and uncirculated coins. Proofs provide finer detail due to multiple strikes on a mirrored blank in the minting process. Uncirculated coins, however, are burnished blanks fed by hand into a coin press and carry the West Point mint mark.Despite its $50 legal tender value, the American Eagle contains one troy ounce of pure gold. Coins remain stamped with “1 OZ FINE GOLD,” and actual worth follows gold indexes. If you compare prices to FOREX’s values, buying fewer than ten will cost you about $68 above spot price. Pass the threshold of 20 or a tube, and prices decrease to around $55 above spot. Despite its $50 legal tender value, the American Eagle contains one troy ounce of pure gold. Coins are stamped with “1 OZ FINE GOLD,” and actual worth follows gold indexes. If you compare prices to FOREX’s values, buying fewer than ten will cost you about $68 above spot price. Pass the threshold of 20 or a tube, and prices decrease to around $55 above spot. 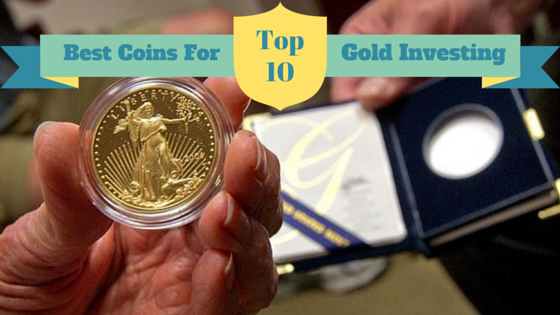 These coins are the favorite coin for U.S. investors and collectors for many reasons. Because these coins are so popular, they are fairly easy to value, trade or sell. They are an approved investment vehicle for Individual Retirement Accounts (IRAs). Too, American Eagle purchases and sales to the public are exempt from the Internal Revenue Service’s Form 1099-B reporting requirements. Numismatics love the American Eagles for their beauty and proudly collect date sets while bullion investors hold them as guaranteed investments neatly stacked against currency challenges or economic crises. The American Buffalo premiered in 2006 as the U.S. Mint’s answer to Canada’s 1-ounce Gold Maple Leaf. Offering .9999 fine 24k gold, it is the purest, highest content gold coin the U.S. Mint produces. Each coin carries the stamp “1 OZ .9999 FINE GOLD” on its reverse. Although it doesn’t take quite the caché of the old reliable American Eagle gold 1-ouncer, that lack is mostly because some investors and collectors are privy to the American Eagle. In 2014, the U.S. Mint sold 180,500 American Buffalos versus 425,000 gold American Eagles. With a buffalo on one side and the classic Native American profile on the other, the American Buffalo also carries a $50 legal tender value. Interestingly, the edges of these coins are somewhat irregular, with thicknesses varying from half a millimeter or more, making the coins as rustic as their tribute to the American West. Whereas the American Eagle can rely on some silver and copper to increase durability, the American Buffalo is purely one troy ounce of 24k gold. Lending the Buffalo coin, perhaps a deeper luster, but also making it softer, more susceptible to wear or damage. Some sites advertise prices at as little as $50 over spot price. However, if you are buying less than 10, prices start at $60 over spot. For avid collectors, American Buffalos from 2006, the original issue year, begin at $160 over spot for 10 or more. If you want to invest in a 2006 American Buffalo Proof, count on spot price plus $575. If you’re looking for something interesting, consider 2008’s first issue of American Buffalo uncirculated gold coins. Only 3,000 or so were minted and — if you can even find one — command spot plus at least $1,700! At four 9s fine and boasting the exacting excellence that has historically set the Royal Canadian Mint apart, the Maple Leaf debuted as — and remains — the 24k baseline and staple for gold 1-ounce coins. Known as the main contender outside the United States because of its purity, the Canadian Maple Leaf carries a legal tender value of $50 Canadian backed by the Royal Canadian Mint. For many years, the Maple Leaf’s only competition for purity and beauty was the Krugerrand; Austria didn’t mint its Philharmonic until 1989, and the United States didn’t produce its American Buffalo until 2006. Canada’s Mint has been producing these coins since 1979, and many investors continue to favor them, despite 2014’s startling 38% overall Maple Leaf dip in sales to favor the Silver Maple Leafs. Gold coins produced from 1979 to 1982 carry three 9s while those after carry four. In 2004, however, the Royal Canadian Mint outdid even itself, producing 24k coins .99999 fine for its 25th anniversary. The Gold Maple Leaf is considered the world’s purest gold bullion and each coin is stamped with the .9999 guarantee of purity and “1 OZ OR PUR.” Too, during gold slump years, when some of the other mints decreased their gold coin production, Canada maintained its levels and ensured its coins were available. It’s no doubt then that the coin was gaining investors and most likely keeping them with the standard of quality and value assurance. In 2013, the Royal Canadian Mint added the security measure of a second micro-engraved maple leaf that holds the last two digits of the date. For 2015, on the reverse, a “15” sits inside the maple leaf privy mark. Also, the mint machined a radial line background onto the master die to create a “unique light diffracting pattern.” The Mint also offers a “Bullion DNA” device that recognizes and authenticates each coin minted by its unique engraving. However, these are still delicate coins for handling, with sharp edges and smooth faces that wear and scratch easily. Currently, you can purchase gold 1-ounce Maple Leafs for $38 over spot for 20 or more. For individual coins, the price over spot approaches $50. Older coins carrying .999 purity — pre-1983 — are slightly lower while 25th-anniversary coins can list for $100 over spot. Within Canada, these are tax exempt. Within the United States, transactions involving fewer than 25 coins at a time are not reportable. For those collectors looking for something truly new and unique, the 2015 gold fractional proof set — while pricey at $4,000 — has a 1-ounce coin with a letter edged serial number and a different maple leaf design on each 1-, 1/2-, 1/4- and 1/10-ounce coin. Moving with the times, the Canadian Maple Leaf seems always to have something new to offer. Lady Britannia has been gracing coins since the first century and will remain a staple in gold bullion investors’ portfolios. Now a standing lady, the gold Britannia represents the British Royal Mint’s contribution to the 1-ounce means of investing. As a means of legal tender, she is not too shabby either, carrying a £100 face value. Coins dated 1987 to 2012 are 22k — the first 2 years alloyed with copper, the next 23 with silver — while those dated 2013 or later are 24k and carry the mark “1 oz 999.9 FINE GOLD.” All, however, contain a full troy ounce of gold. Free of both VAT and capital gains taxes, gold Britannias offer competitive investment opportunities as little as $40 (£26) over spot for 2015s if you buy 20 or more. Most proofs are available only in sets, so those available may be pricey. Only 10,000 proof sets made it in the debut year, so now a four-coin 1987 proof set commands about $190 over spot. These coins are also available in 1/2-, 1/4- and 1/10-ounce sizes, with face values of 50, 25 and 10 pounds, respectively. Counterfeiting and fraud are always of concern with anything valuable. In 2014, the Royal Mint introduced its Horse Privy 1-ounce Britannia gold coins. Along the rim, each coin carries eight stamped galloping horses, bringing to mind the chalk horse of Uffington, marks of authenticity. One or two will cost you spot plus nearly $100. Buying 20 or more brings the price down a bit to $90 over spot. With the Royal Mint’s attention to beauty and detail and the coin’s tax-free status in the United Kingdom, the gold Britannia will continue to reign in the United Kingdom. A favorite outside of the United States, the Krugerrand is usually one of the least expensive gold coins and instantly recognizable with its springbok antelope. While some complain that it’s not as detailed or magnificent as some of the other more elaborate gold coin reliefs, it has been around since 1967 and remains an accessible, durable investment. Investors have purchased more Krugerrands than all of the other 1-ounce gold coins together.At 22k, the Krugerrand contains 8.33% copper to stabilize its one troy ounce of gold and make this a durable commodity. Each coin gets stamped with “FYNGOUD 1 OZ FINE GOLD.” Touted as excellent investments for beginners and seasoned buyers alike, Krugerrands are also usually easy to sell. However, the spread between investment price and sales yield may be small, depending on the precious metals market. The Krugerrand’s value corresponds directly to the rand-dollar exchange rate and the current dollar gold price, so establishing value is relatively straightforward. In 1980, Krugerrands also became available in 1/2-, 1/4- and 1/10-ounce sizes. At 22k, the Krugerrand contains 8.33% copper to stabilize its one troy ounce of gold and make this a durable commodity. Each coin gets stamped with “FYNGOUD 1 OZ FINE GOLD.” Touted as excellent investments for beginners and seasoned buyers alike, Krugerrands are also usually easy to sell. However, the spread between investment price and sales yield may be small, depending on the precious metals market. The Krugerrand’s value corresponds directly to the rand-dollar exchange rate and the current dollar gold price, so establishing value is relatively straightforward. In 1980, Krugerrands also became available in 1/2-, 1/4- and 1/10-ounce sizes. In the past, when gold prices went down, Krugerrands became harder to purchase only because no one wanted to sell. Currently, prices for Krugerrands are running as little as $33 over spot in lots of 20 or more. If you’re looking to buy fewer than 10, add another $10 to that figure. Proofs are much harder to come by and can run $500 to $700 over spot. They are different: while bullion coins have 160 edge serrations, proof coins have 220. Keep in mind Krugerrands are one of the easiest coins to counterfeit. In the past, counterfeiters have covered carbon tungsten cores with a gold-copper alloy, so if a deal seems too good to be true, it just may be. Whether you are considering buying for investment or a gift, Austrian Philharmonic gold coins are real masterpieces. The largest in diameter of all the 1-ounce gold coins at 37 millimeters and .999 fine 24k, it is a stately work of art as well as a financial vehicle of investment. The obverse features the Viennese Concert Hall’s famous pipe organ while the reverse displays a host of musical instruments. Currently advertised on some sites at as little as $33 over spot, the Philharmonics track well with gold prices. If you are considering 20 or more, the Philharmonics are a good buy and a favorite, especially in international financial circles. Current production levels make them readily purchased, with mint runs of 500,000 or more. However, if you are interested in first-year issue coins from 1989 or low-issue years like 2006 or 2007 — when runs were about 82,000 and 108,000, respectively — expect to pay up to $125 over spot. As gold bullion, Austria’s Philharmonic gold coins remain a must-have option for most financial portfolios as well as collectors with an eye for aesthetic appeal. As a bullion investment, Canada’s 1/2-ounce Maple Leaf offers the security of adding 24k fractional coins to your precious metals portfolio. With the expected .9999 fineness and a Royal Canadian Mint guarantee of weight and quality, these second-largest Maple Leafs carry a legal tender value of $25 Canadian and 1/2 troy ounce of gold. Just like the 1-ounce Maple Leafs, these smaller coins also give the added security measure of light-diffracting radial lines new to 2015 and, as always, the guarantee of “1/2 OZ OR PUR” and four 9s. In times of worldwide financial uncertainty, known quality backed by a stable, secure government makes the 1/2-ounce Maple Leaf uncirculated bullion highly desirable and worth its weight in gold. Although the spread between spot and price increases as coin size decreases, these are still worthy investments. Current prices run $104 over spot for less than 10. Order more than 20 and the price falls to $92 over spot per ounce. Just like its 1-ounce big brother, the gold ½-ounce American Eagle is 22k but contains a full half ounce of gold along with a silver-copper alloy to make it more durable. Each coin bears the stamps “1/2 OZ FINE GOLD — 25 DOLLARS,” assuring bearer and recipient of what is being proffered. Just like the 1-ounce coins, 1/2-ounce bullion dated prior to 1992 carries Roman numerals; those minted since bear Arabic numerals. Although gold American Eagle bullion is popular, investors purchase only about a third of the 1/2-ounce uncirculated coins as compared with the 1/4-ounce fractionals. Mintage has been steadily decreasing for the past five years. In 2014, the U.S. Mint sold 35,000 1/2 ounce bullion coins versus 90,000 1/4 ounce ones. Many speculate that this is because half an ounce is still a treasured amount of gold, perhaps a little too large for barter or crises, especially when you compare its markup against that of the 1-ounce coin. Current prices run about $110 over spot for fewer than 10. Order 20 or more, and prices decrease to about $100 over spot per ounce. Stamped “1/4 OZ OR PUR” and “9999,” Canada’s Gold Maple Leaf is not quite the smallest but still is mighty. With a legal tender value of $10 Canadian, it is a go-to bullion acquisition for those who want access to significant but portable quantities of 24k gold. Sensitive to demands, the mint expanded Maple Leaf options into smaller sizes, keeping the 1/10- and 1/20-ounce weights and adding in 2014 a 1-gram, or 1/25-ounce, coin. The Gold Maple Leaf seems to be holding its own, however. Current market prices quote $132 over spot for orders of fewer than 20 while orders of 40 or more are about $120 over spot per ounce. A bit pricier than the American Eagle 1/4-ounce bullion, the 1/4-ounce Maple Leaf has all the same micro-engraved security features the Royal Canadian Mint offers in its larger versions. Not quite the smallest denomination of 22k gold American Eagle, the 1/4-ounce coin holds its own in today’s market. Smaller, yet still marked “1/4 OZ FINE GOLD — 10 DOLLARS,” it is a favorite among bullion investors seeking diversity and multiple levels of liquidity in their precious metals portfolios. In 2014, buyers purchased 90,000 bullion coins, a relatively steady figure for the past 5 or 6 years. Interestingly, the mintage for the 1/10-ounce Gold American Eagles remains high, with 545,000 sold. These smaller coins hold a significant attraction for the jewelry market. However, they also are smaller portions of gold that some view as more easily bought, sold, traded or bartered. Despite the higher price per ounce, for some individuals, they are more viable instruments for commerce and currency. Current prices for 1/4-ounce Gold American Eagles run around $135 over spot for fewer than 10. Order 100 or more, and prices fall to around $118 over spot per ounce — a bit more than the 1/2-ounce bullion but not nearly the leap that exists between the 1/2- and 1-ounce coins. With uncertainty looming and markets slowly declining, investors who purchased bullion when gold was running around $1,800 on spot no doubt have many regrets. However, with the price of gold hovering under $1,200 per ounce, investing in tried and true secure gold coins that bear stamped guarantees backed by stable governments is an investment strategy well worth considering and maintaining. The Gold American Eagles, American Buffalo, Maple Leafs, Britannia, Philharmonics, and Krugerrands are long-time staples ensuring a portfolio’s quality, security, liquidity and longevity.